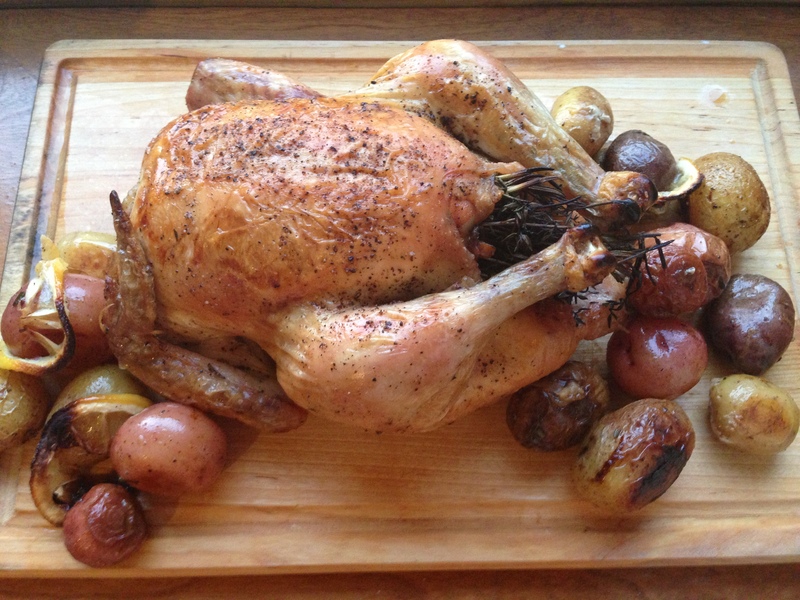 If you’re intimated just by the thought of roasting a whole chicken, I urge you to continue reading. This will be the easiest, no-hassle meal you’ll ever make and it will go a long way. The best part is that this little bird only costs $10 and you can stretch it all week long. Are you convinced yet? 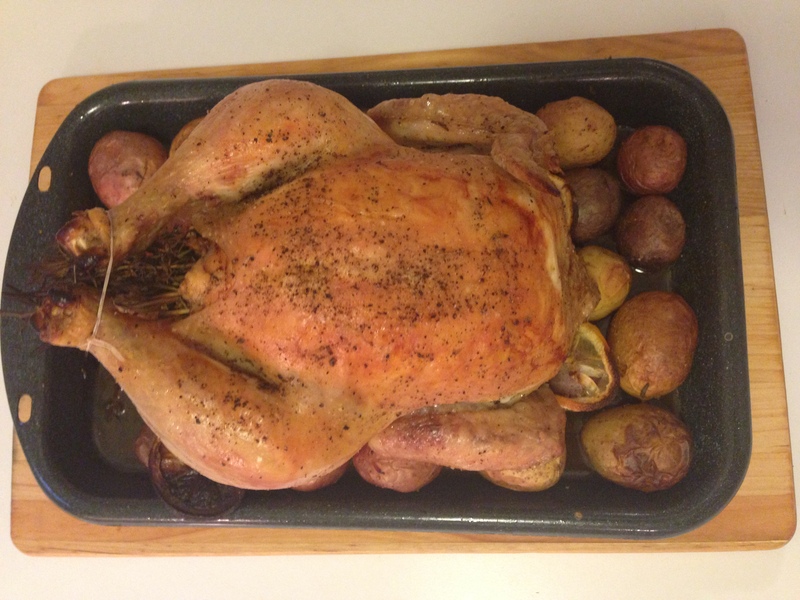 Keep reading.Imagine the look on your special someone’s face when you casually pull a perfectly roasted chicken out of the oven, and look good while doing it, no less (you’ll have had 1.5 hours to get yourself ready while the bird roasts). And you’ll need to learn how to roast a chicken at some point in your life. So start with this and you’ll never go back. Start by preheating your oven to 425 and prepping your potatoes. Prep your potatoes by first rinsing them in water. 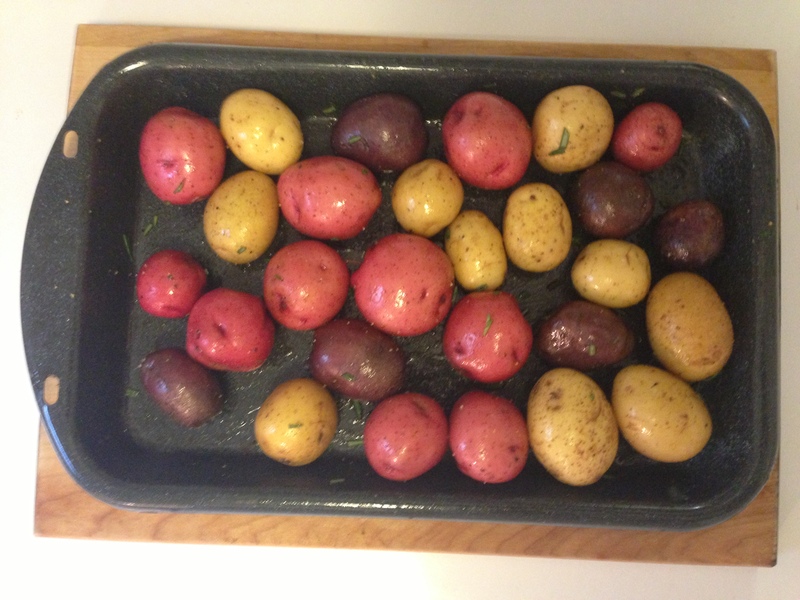 Dry them, throw them into a roasting pan, and generously coat them with about 2 tablespoons of olive oil. If they’re too large, cut them in half. Sprinkle generously with about 1-2 teaspoons each of salt and pepper and about 1-2 teaspoons of chopped fresh rosemary. Now wash your chicken. 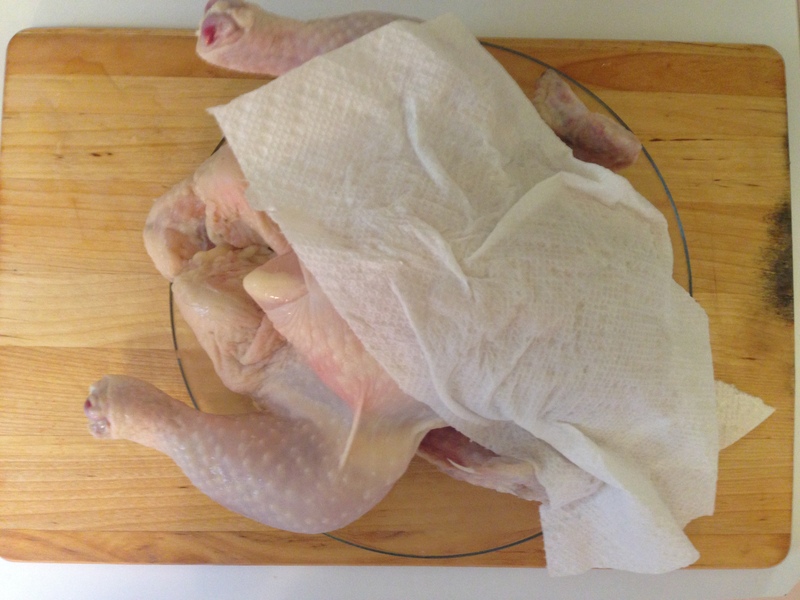 Remove the innards and pat dry with a paper towel. Be sure to dry your chicken thoroughly otherwise it’ll steam instead of roast. Season the cavity of the bird with salt and pepper. 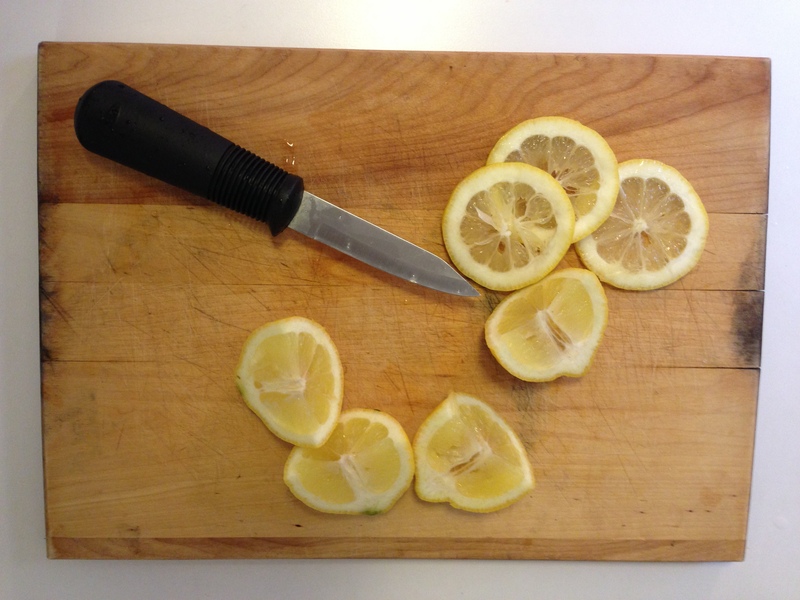 Cut a lemon into quarters. 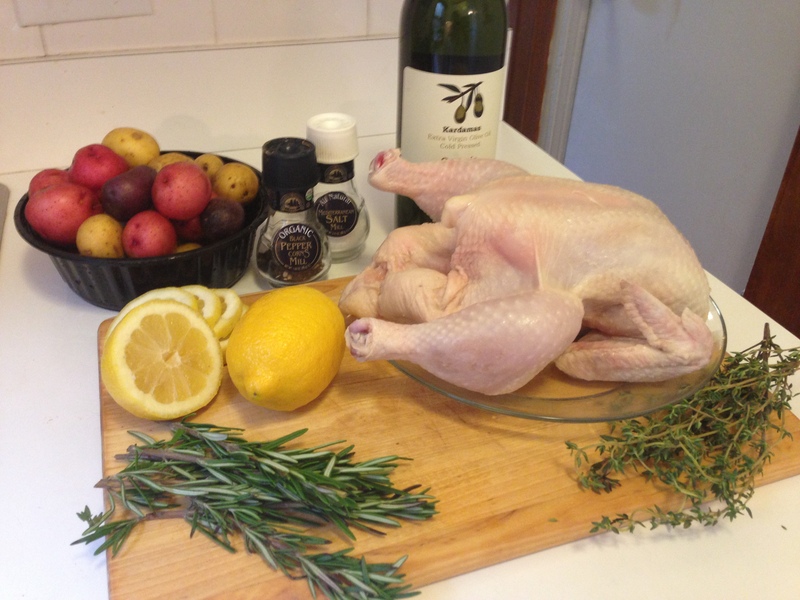 Stuff the bird with the four lemon pieces and two bundles of rosemary and thyme. 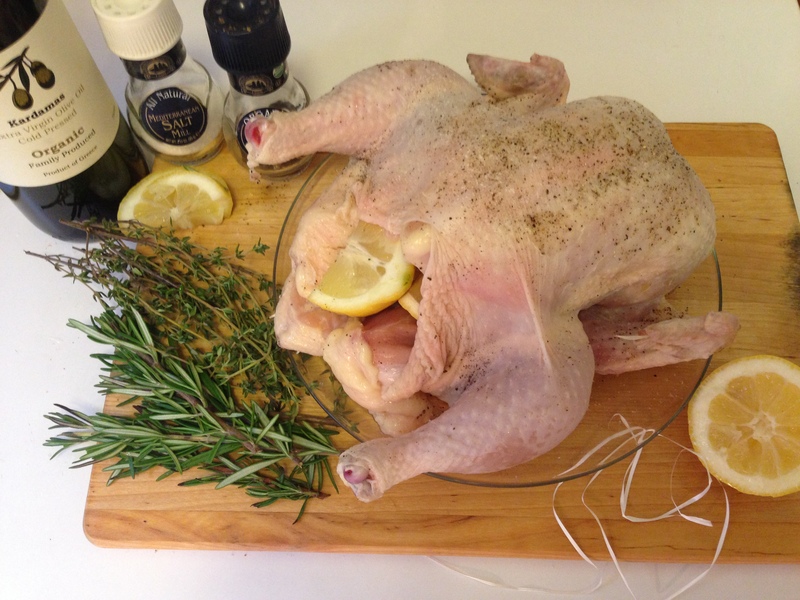 Using your hands, slather the outside of the bird with about 2 tablespoons of olive oil all over. Season the outside with salt and pepper. Place your chicken on top of your potatoes. Tuck its wings under the body and tie together its legs (I use dental floss for this). The reason you do this is so that the chicken cooks evenly. 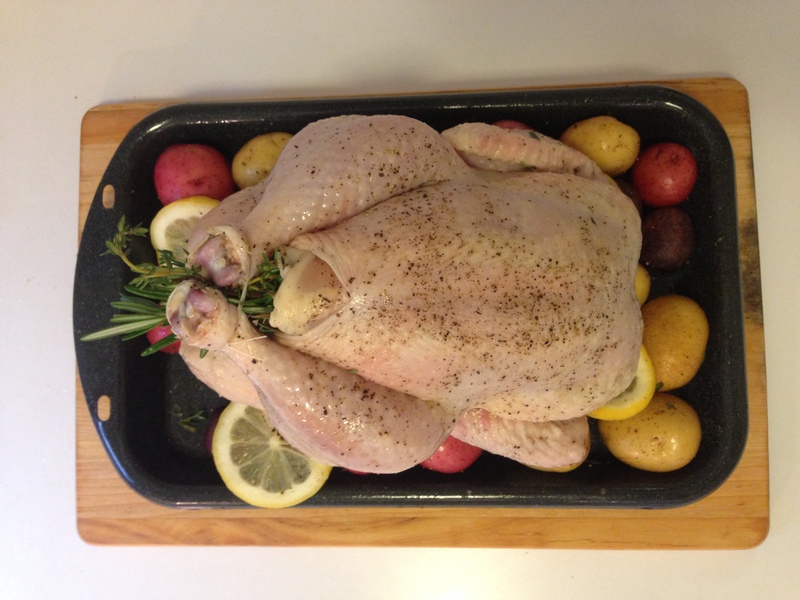 Now place the roasting pan into the oven for about 1 hour and 20 minutes. That’s it. Walk away. You’re done. 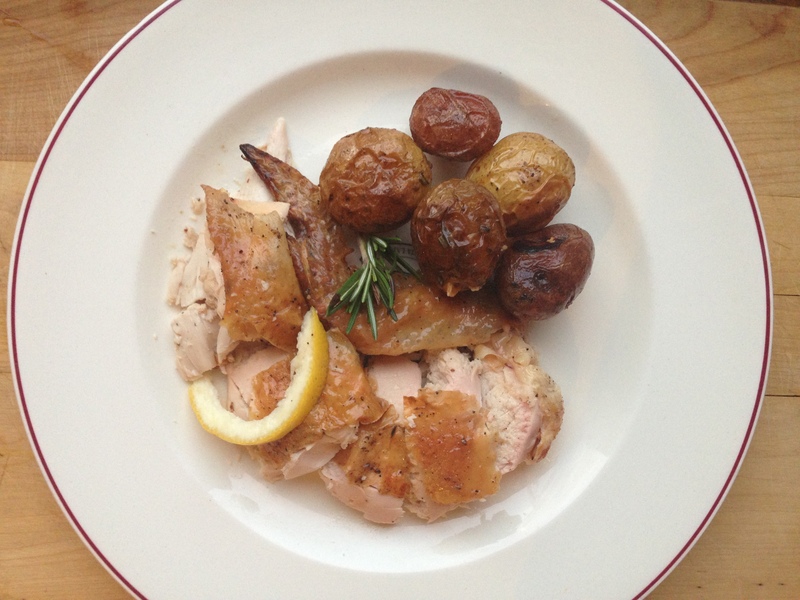 After you take it out of the oven, take a knife and make a small incision near the drumstick. If the juices run clear, it’s done! Now for the most important part. I cannot stress the importance of letting poultry or meat rest. Nothing pains me more than seeing people cut up a steak right after it’s taken off the grill, or carve a turkey the moment it comes out of the oven. The moment you do this, the juices escape and you might as well be eating desert sand. Okay, that’s aggressive, but did I make my point? 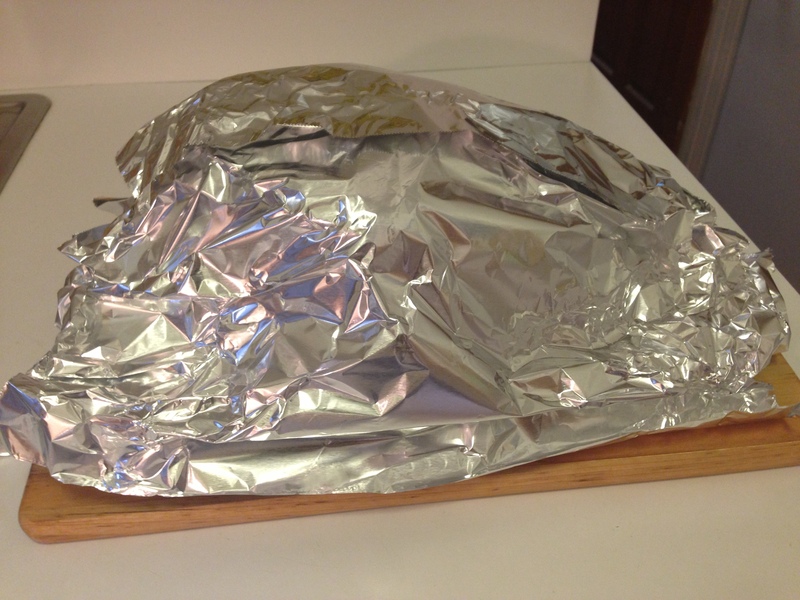 Get your tin foil out and tent the chicken. I let mine rest for about 20-40 minutes or longer. Trust me, the chicken will still be too hot to touch when you finally carve it up later. I prefer carving my chicken by removing both breasts so they come off in two large pieces. Then I slice those up and plate them alongside some potatoes. You won’t need gravy, but if you want it, take your pan drippings and place them into a bowl. Pour the contents through a strainer. Pour the drippings into a small pan and heat gently, whisking in a pinch of flour until you reach your desired consistency. Thanks, Katie! I’m so glad you tried this… see how easy it is? I love that it’s simple enough for a weeknight dinner yet elegant enough for a dinner party. Be on the lookout for more recipes like this coming your way! This was so good! It was so moist and flavorful, and easy to make. Thank you, Becca, for another great recipe! 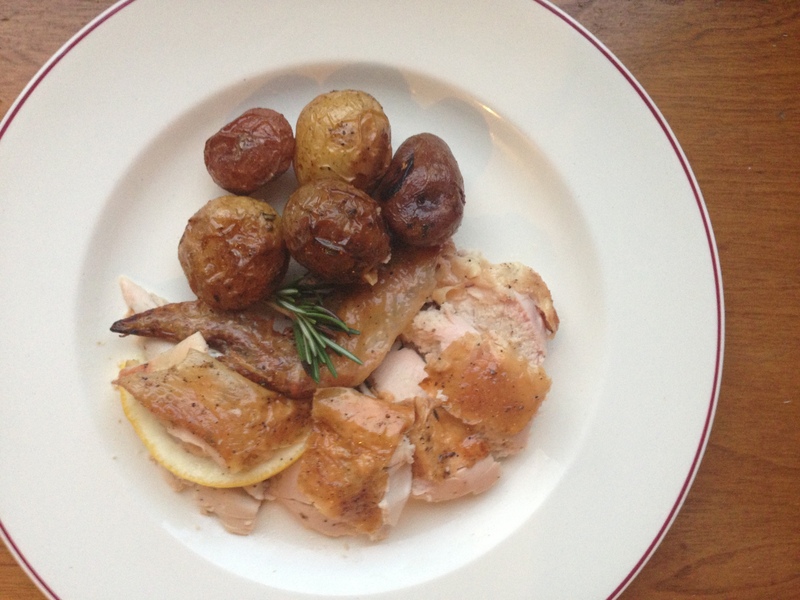 Let me know how your next roast chicken comes out! What a terrific tutorial. 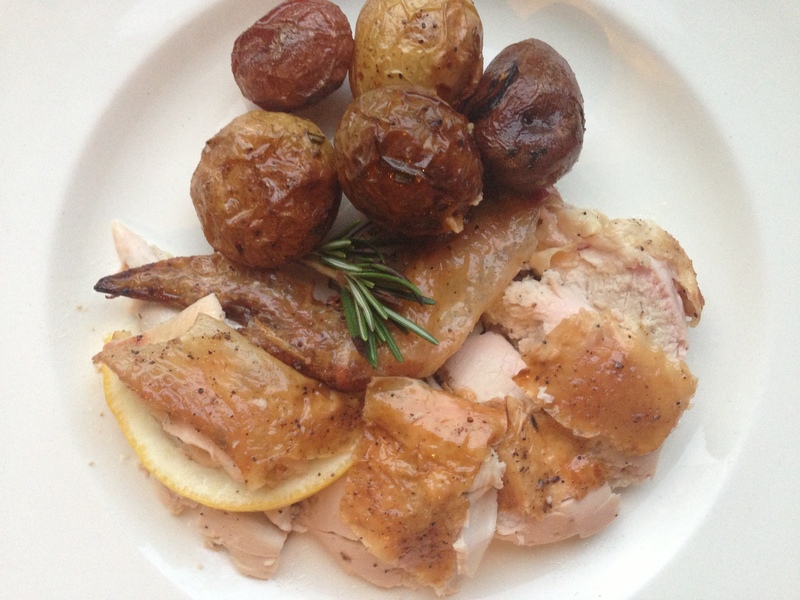 I roast chickens quite often, yet I picked up some great tips. Thank you. Thanks, Joy! You’ll have to try it sometime. It’s so simple to make and tastes just as good as it looks. 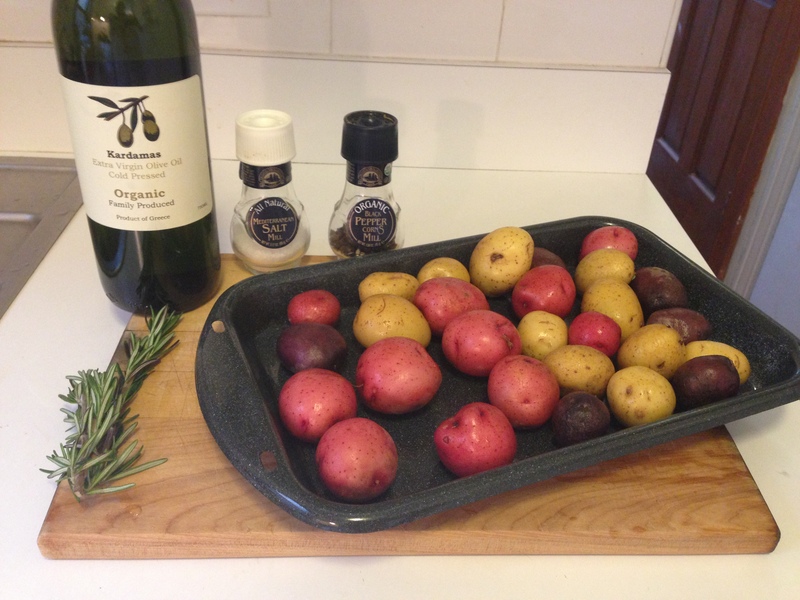 This recipe looks beautiful, I love all the different potato varieties as well! That is awesome, Bec! You have such a great style with your writing…and you have made my mouth water with those fab pictures!!! Keep cooking up a storm! !